The Pulsair oil gas mixer mixing is applicable to all phases of the oil & gas process including exploration, storage, transport and production. Pulsair offers highly efficient and effective mixing at any liquid level in any size tank at any liquid level. Pulsair can keep heavier sludge suspended in large storage tanks to increase tank capacity and production output. 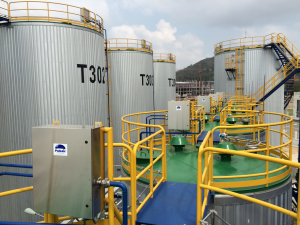 Tanks no longer have to be taken offline and the customer can keep the heavier crude uniformly mixed and homogenized in the tank. This keeps the heavier sludge from solidifying on the tank bottom. Customers can pulse with compressor air or other inert gases.